You are here: Home / Uncategorized / She’s here, she’s here! 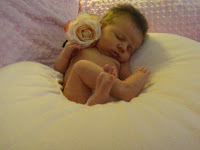 She made her debut two weeks early, on May 14, 2010. She was 7lbs, 9oz and 19in. Yay! Welcome to the world, FPK!! Hello beautiful! Welcome to the world. Can't wait to meet you, bella. Congrats!!! Can't wait to see more photos of the sweetie! Her name is Flynn??? Oh, I love it! I look forward to seeing more pics of this beautiful little girl. Enjoy the pink! Yup Korie, I had a feeling you'd especially like her name! More on that to come in another blog.